The more I learn about tea, the more I want to learn. The more I experience, the more I want to experience. I experiment, I read books, I read blogs, I attend tea conferences, and I take classes. I buy tea from all over the world, and try out different blends and combinations. Basically, I do whatever my budget allows. 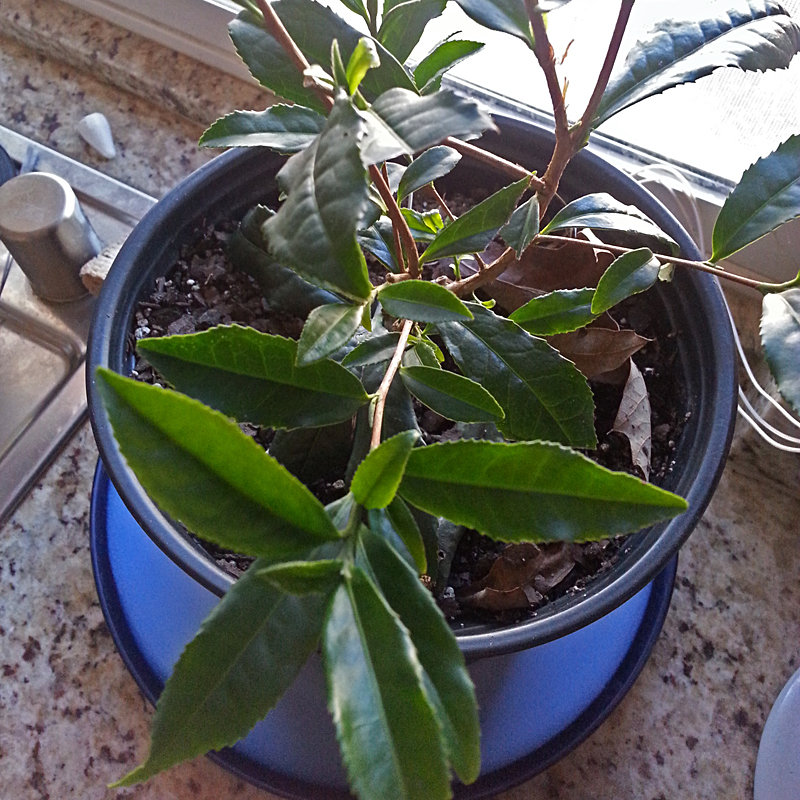 This is Naomi’s little plant (she represents Nevada in #TeaAcrossAmerica). She named it “Teany.” I’m now taking suggestions for a name for my plant when it arrives. One thing my budget has not, alas, allowed has been traveling to the world’s great tea growing areas and getting familiar with tea bushes. My tea experiences all start with processed leaves, not with the plants themselves. Today marked the first step in changing that. I got a phone call this afternoon from Naomi Rosen, of Joy’s Teaspoon. I met Naomi at a blogger’s panel at World Tea Expo 2013 this summer (CAUTION: this link to World Tea Expo plays video and makes noise — careful where you are when you click it). Naomi was calling because she’s working with Jason McDonald of FiLoLi Tea Farm and the United States League of Tea Growers on a new initiative they call #TeaAcrossAmerica. Their simple yet ambitious objective: put a tea plant into every state and the District of Columbia. Some U.S. states already have established tea plantations. Others have hobbyists with a few bushes going. Many states have climates that Camellia sinensis considers inhospitable. I happen to live in one of those states: Montana. Naomi asked if I’d be willing to represent Montana in #TeaAcrossAmerica, and I jumped at the opportunity. To participate, I need to take a cutting from FiLoLi Tea Farm in Brookhaven, Mississippi, and grow it here in Montana. Jason has written up some directions to make caring for the cutting easier, and I’ll be able to keep it indoors where the harsh Montana winters won’t kill it. My tea bar has east-facing bay windows that should be a great place to keep the plant, with full morning sun and afternoon shade. The only problem will be humidity — it’s very dry here — but we can deal with that. It’s going to be a month or two before my little tea bush arrives, so we have plenty of time to prepare. I will keep everyone up-to-date on the progress as we get things going. In the meantime, thanks to Jason for the opportunity and to Naomi for suggesting me as a volunteer! Posted on 6 November 2013, in Tea Thoughts and tagged #TeaAcrossAmerica, blogger's panel, Camellia sinensis, FiLoLi Tea Farm, Jason McDonald, Joy's Teaspoon, Montana, Naomi Rosen, Tea Across America, tea plants, Teany, U.S. League of Tea Growers, World Tea Expo. Bookmark the permalink. 7 Comments. Is it sad that I’m the most excited to see what you name your plant? You set the bar pretty high with “Teany,” Naomi. I can’t just name the plant “Harold.” I’m considering using the name of one of the characters in the book I’m working on (“Myths and Legends of Tea”), but it’s hard to resist a good pun like Ellie or MonTEAna. Great article, Elyse! I’m looking forward to the whole process! I vote that you name your plant, Mr. Excellent.